How valves, pumps and other components will dynamically interact with each other during a surge event? The forces generated by transient pressures needed to design your pipe supports? If you are in compliance with ASME B31.3 requirements for occasional loads? Will your system experience significant pressure surges due to cavitation? If you have the right surge suppression equipment to mitigate the catastrophic effects of waterhammer/surge and other undesirable system transients? Luckily, exporting your AFT Fathom™ model to AFT Impulse™ will save you time as you answer these questions and validate the design of safety features to produce safer and more economical pipe systems. Give yourself a head start...Decrease modeling time by 80% when you import your AFT Fathom model directly into AFT Impulse using the same interface and functionality you appreciate from AFT. Enjoy 10% off Until March 31, 2019! 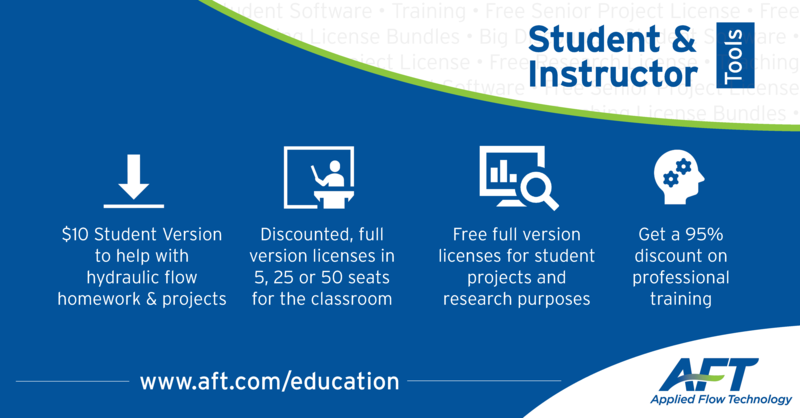 For a limited time, AFT Fathom users can enjoy 10% off AFT Impulse. Contact us for a quote or to schedule a live demonstration so you can see how using AFT Fathom and AFT Impulse together can create a better and safer piping system. Search for the folder your AFT Fathom model is located in, select it, and open the model. The AFT Fathom model will automatically generate an AFT Impulse model. Adjust as required for transient analysis. Loukas Papathanasiou, Process Manager for Fluor, utilized AFT Fathom and AFT Impulse to complete the design of a cooling water system and the analysis of that system’s surge transients. Using both software programs together gave him the ability to easily simulate, analyze, and troubleshoot the massive system. Papathanasiou created a steady-state model in AFT Fathom to simulate the cooling water hydraulics during a major upgrade to a refinery in Kuwait. Part of the Kuwait National Petroleum Company (KNPC) Clean Fuels Project (CFP), the Mina Abdullah Refinery was expanded to refine 454,000 bpd via this multi-billion-dollar project. Fluor designed and constructed the new cooling water system, which circulates 40,300 m3/h (177,000 gpm) of cooling water to the new CFP units. Papathanasiou used AFT Fathom to size the equipment and to model heat transfer to determine fluid temperatures. The AFT Fathom model made extensive use of the heat exchanger feature to properly size and ensure the capacity of the equipment for the upgrade. Then the extensive AFT Fathom model was used to generate the AFT Impulse model which performed the surge analysis to ensure technical integrity during transient events, in compliance with the international standards (ASME, AWWA) and the SHELL Design and Engineering Practices (DEP). The AFT Impulse model made use of the discrete gas cavity model (DGCM) to calculate cavitation and vapor formation. This was important for the execution of this study considering extensive vacuum generation and collapse had been occurring in various locations throughout the system. The dual vacuum break/air release valve feature was important too, as these were used to mitigate the excessive surge pressures by letting in atmospheric air to prevent low vacuum pressures. Finally, the Scenario Manager contributed in optimum handling of changes and operating cases in the model as it automatically applied the change to all sub-scenarios. The model was created based on thousands of isometrics. “Using the seamless transfer from the AFT Fathom steady state hydraulic model to the AFT Impulse, the manhours spent for the surge analysis were significantly reduced, resulting in reduced cost and schedule for this Lump-Sum project,” said Papathanasiou. We can't tell you how many customers tell us they will only commission a system if an AFT analysis was run on it prior to handing it over. One customer told us about a time they ran an analysis, but the logic didn't seem ….well logical… to the other design engineers. They built the piping system the way they deemed it logical. And it was wrong. They went back to the AFT analysis and built it how the pipe flow model showed the system would run. They spent several weeks and a lot of unnecessary dollars because what seemed illogical was the most logical after all. You see, AFT doesn't create hydraulic flow analysis tools simply because we like to ensure pipe calculations and sizes are correct; we are a software built by engineers for engineers to help make your piping system design run as efficiently as possible and to ensure you are able to troubleshoot transient issues in a timely fashion. Most engineers recognize how easy and reliable AFT Fathom is. It gives engineers at all levels the ability to design and troubleshoot their steady-state fluid systems in AFT Fathom. What most are unaware of, is those same engineers can use AFT Impulse to analyze the transients to see how the system will behave in the event of a power outage, a pump trip, a valve slam, evaluate vapor cavities, or pressure extremes. Let us show you how AFT Impulse can help you be proactive in designing sustainable and safe piping systems.